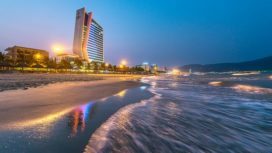 Grand Tourane Hotel Da Nang is conveniently located just 5 km from Da Nang International Airport and a short walk from the beautiful My Khe Beach. This Hotel is a 1-minute walk from the beach. It offers an outdoor pool and free Wi-Fi. 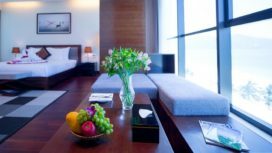 This centrally located hotel is just 2.3 km from Song Han Bridge, 2.5 km from My An Beach and only 3 km from the city center. The rooms are typically Vietnamese with a minibar, an electric kettle, an en suite bathroom with a hot shower and air conditioning. Grand Tourane Hotel Danang has a 24-hour front desk and a charming garden where guests can relax with a coffee. An airport shuttle service is available (extra charge). 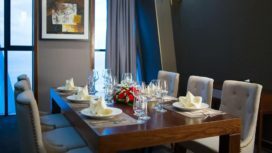 The on-site restaurant serves authentic Vietnamese cuisine. 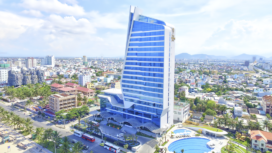 The Grand Tourane Hotel in DaNang City is a 5-stars hotel, it has 189 luxurious rooms including about 120 rooms which cost 75 Euro per night. “Accomodation package” includes 3 nights at Grand Tourane Hotel for single (single bed) for the value of 225 Euro. The hotel will charge 10 Euro/night for acompanying person (to upgrade queen bed or twin beds and breakfast).